Book of Ra Deluxe was created by Novomatic developer Greentube. It is themed to Egypt and is available to play for free at NeonSlots. The game has 5 reels, 10 adjustable paylines, a special expanding symbol, free games which are launched by the scatter symbol and a double or nothing gamble round. When 3 Scatter symbols land anywhere on the screen the round of 10 free games is launched. When you click on the start button the pages of the Book of Ra turn and a special symbol is selected randomly, if the minimum number (2 or 3) of these symbols land on the reels then each symbol will expand to cover all 3 positions on those reels. The multipliers will be the same as during regular spins, however with 2 or more reels filled with these special symbols, the payouts can become quite large. During the free games all payouts of regular symbols use the same bet and line settings that were in place before the free games round was triggered. The special symbols are counted regardless of their position on the reels and cannot be substituted by a scatter symbol. If three more scatter symbols land during the free games session you will win another round of Free Games. A winning combination in this gaminator slot by Greentube is when identical symbols line up from left to right, along an active payline, starting with the first reel. Only the highest win per line will be paid. This slot has 5 themed symbols, the Book of Ra, an Archeologist, a Pharaoh´s statue, A Goddess Idol and a Scarab beetle and playing card symbols 10, J, Q, K and A and the multipliers listed in the paytable, are applied to the bet per line. The Scatter symbol is the Book of Ra, its combos can be created when they land anywhere on the screen, and the multipliers listed in the paytable apply to the total bet. It can also be used as a substitute for all other symbols to complete or extend existing combos. Only the highest paying Scatter combo will pay, however, Scatter wins and line wins are added together. If 3 or more scatter symbols land you will launch 10 free games with a special expanding symbol, which cannot be substituted by a scatter symbol during Free Games. When a winning combination lands, at the bottom of the screen you will see the amount that you have won. You can collect your winnings by clicking on the Collect button or gamble them in the Double or Nothing game using the Gamble button. A new screen will open up and in the centre you will see the back of a playing card which flickers between red and blue. To the left of it is a button that says Red and to the right, a button that says Black. At the top left of the screen you will see the Gamble amount and Gamble to win amount. In the top right the previous 5 cards are displayed. Click on your choice of Red or Black and if successful you can repeat this process or collect your winnings. If you are unsuccessful then you will lose all your winnings and return to the main game. 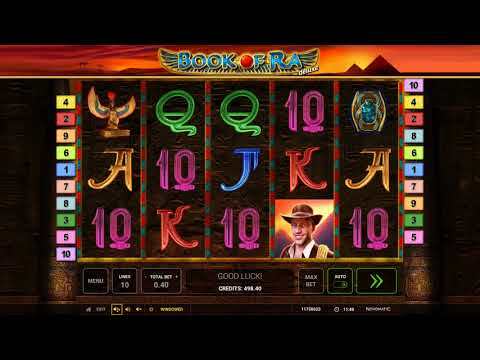 If you liked the gameplay of the Book of Ra Deluxe online slot, you may also want to play the classic version Book of Ra or the 6-reel slot Book of Ra Deluxe 6. There are two different versions of Novomatic Gaminator online slot Book of Ra Deluxe depending on which country or device you are playing from. The original version has a control panel beneath the reels and the new html5 version has a menu box which opens the settings for the game. If you wish to switch the slot to Autospin mode: instead of clicking on the circular arrow below the Menu section, if you click and hold the mouse button, you will see the background of the button changing colour, when it has fully changed you can release the mouse button and the autospins will commence. Click this button again to stop the autospins. At the bottom of the screen you will see the total bet for each spin. Below this is a line with a dark blue background. On the left you will see your balance in credits and the amount of credits previously won is displayed on the right. Reality Check - This new feature from Novomatic is only available on the html5 version of this online one armed bandit. You can set it to interrupt your game after a certain time has passed and it will give you the statistics of your game play including session duration, how much you have bet, the amount of winnings you have received and your account history. You can then choose whether to continue to play or close the game. The paylines appear in the 10 numbered boxes on eitherside of the reels, the route of the payline is shown when you click on them and the number inside each box shows how much the bet per line is. To leave the game, open a detailed description of the rules, change the screen size or adjust the sound and music settings, use the buttons that are in the top right hand corner. Underneath these buttons is a clock, and in the top left corner there are buttons which allow you to add more funds to your account, when playing the Book of Ra Deluxe for real money.